View of “The Living Room,” 2013. This exhibition features a group of midwestern artists who employ tropes of domestic interior decorating in a series of tableaux that form the titular living room, along with a modern design-inspired communal table and a tree fort whimsically decorated with clusters of nostalgic framed prints and tchotchkes. Bear Skin Rug (all works 2013) from design collective Such + Such is rendered in wood rather than the expected fur, while ceramicists Katie Parker and Guy Michael Davis’s ornamental White Light, Bear offers a chandelier that illuminates Such + Such’s Table beneath it. 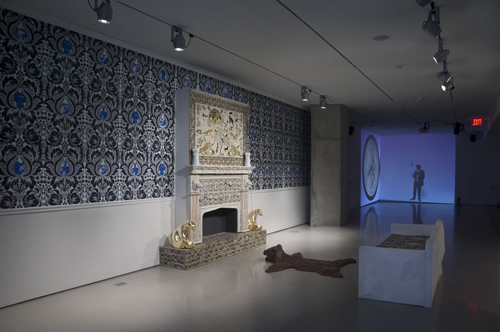 Terence Hammonds’s Wallpaper covers the gallery walls with screenprinted designs. Nestled in Hammonds’s elaborate patterns are witty subversions: Photographs of riots and riotous concerts explode out of the otherwise uniform scrollwork. Here, the possibility of nuanced commentary embedded in the works risks being obfuscated by trendy conceptions of museums as dynamically flexible sites of social exchange. Viewers—nay, participants—are invited to get comfortable in the artist-constructed lounge-like atmosphere. Accompanying public programming blends late relational aesthetics with artisanal craft revival sensibilities. The question of who is meant to be and who in fact is at home in these interactive environments calls for self-criticality from everyone involved. Paul Coors’s video program “Unidentified Man or: How I Learned to Stop Worrying and Love Y’all” breaks from the illusion of domestication that the rest of the exhibition conjures. It also offers needed points of contrast to the signifiers of affluence deployed throughout the exhibition. In one segment, the poet Dana Ward riffs on Kmart shopping, socioeconomic distinctions, and class aspirations. In another, a man strolls through suburban neighborhoods and urban streets, including those that directly surround the Contemporary Arts Center. Coors—as the VJ at this house party—conscientiously calls attention to how the contexts of social spaces within museum spaces always raise issues of agendas, audiences, and access.